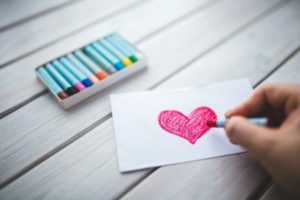 We’re publishing this event guide a bit on the early side because the weekend gets off to a quick start with Valentine’s Day and stretches right on through to Presidents’ Day. When we tell you that this weekend is absolutely stacked with activities, we’re not joking. 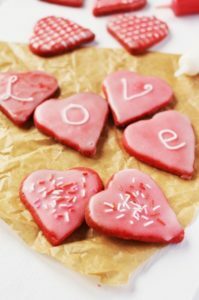 One of our finest Park City treasures, the Park City Library, is celebrating Love Your Library Week with books and cookies. Not only do you get to enjoy the sweet treats – you’ll get to take a free book home with you (which, for some of us, *is* the sweet treat). The library encourages the community to try one of the (truly incredible) resources it regularly provides to our residents. They will help you create a 3D print, take a virtual reality trip, and show you where to look to view some lovely artwork created, of course, by our local artist community. We are in the thick of winter here in Park City, with the snowstorm howling outside for the next few days. 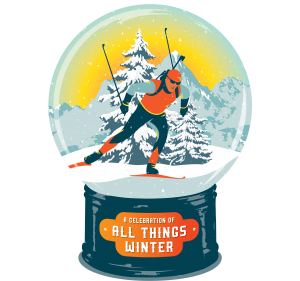 Perfect timing, then, for the Legacy Winter Fest – which “celebrates all things winter” at Soldier Hollow Nordic Center. Schedule HERE – scroll down for the list. A… different sort of passion-filled evening with your Valentine. 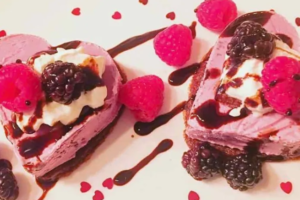 This Mindful Cuisine cooking class starts with oysters and closes with a chocolate and passion fruit dessert. All talent levels are welcome (take it from us, we are at the no-talent level and we *still* had a blast) at this 21 & older event. The Paint Mixer bills itself as Utah’s first locally owned and operated paint and sip experience since 2012 and participants are asked to arrive at least 15 minutes before your class is scheduled to begin. 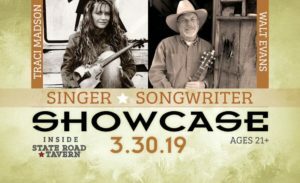 With the guidance of professional singers and songwriters from Nashville, you’ll be part of the creation of your very own, personal love song. All proceeds from the $150/person entry go to benefit the Kimball Art Center, and the tickets include dinner and wine, too. After school, kids ages 6 – 10 can explore art using a variety of fun materials each week. Drop-ins welcome. A full schedule with teachers and projects is available online. 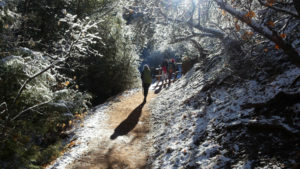 A one-of-a-kind dog sled experience from Rancho Luna Lobos. 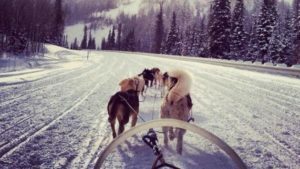 The dogsled tours happen year-round at their ranch. A new part of the experience is the kennel tour, a presentation, and time to play with the pups before the ride. And – maybe the best part – participants get to take turns jumping on the back with the musher to experience what it feels like to drive the team. Each session lasts about an hour and a half. More information HERE. These deceptively simple drawings frame the public’s understanding of early-to-mid twentieth-century world events and trends ranging from the two world wars, the great depression, public discontent with the US government, presidential elections, daily battles regarding work-related rejection, nostalgia for homespun neighborhood charm in the Midwest, and more. Along the way, these cartoons served a dualistic intention: to provide welcomed comic relief as well as shape opinion. 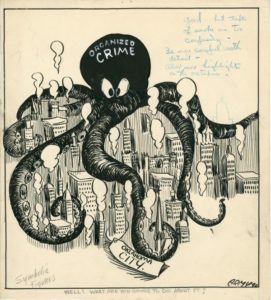 The cartoonist draws strength from the limited conventions of the newspaper context. Just as the strict rules of a haiku challenge the poet to create exactly the right mood within the tight construction of very few words, the editorial cartoonist presents a powerful distillation of political argument through a single image and maybe a few well-placed labels or a short caption. 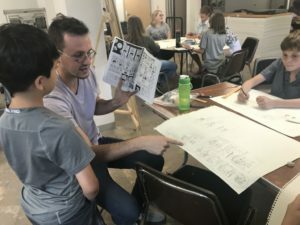 To accomplish this underappreciated feat, cartoonists develop their own language—a language taught to and subsequently shared with their readers. Standard symbols such as the oft-used Uncle Sam or Statue of Liberty evoke abstract concepts such as nation, patriotism, and public interest. On a darker side, cartoons reveal the inherent cruelty of prejudice, xenophobia, and ignorance. Heber City turns on the fire pit and welcomes a different food truck every Monday, Friday, and Saturday evening! You’ll find them parked adjacent to City Hall, and you’re welcome to settle in by the fire to enjoy your dinner (take-out, of course, is an option, too). If you plan to stick around to eat – be sure to bring along some s’mores fixings for dessert! You can find the schedule HERE. 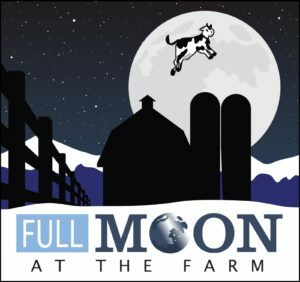 Not only do you get to snowshoe in the moonlight, but you also get to enjoy delicious dinner and a live band. The snowshoe is appropriate for all levels, and shoes will be provided as needed. Dinner starts at 6:30, music plays till 8:30, and the snowshoe begins after that. Purchase tickets HERE. “On the margins of Tokyo, a dysfunctional band of outsiders is united by fierce loyalty, a penchant for petty theft and playful grifting. When the young son is arrested, secrets are exposed that upend their tenuous, below-the-radar existence and test their quietly radical belief that it is love—not blood—that defines a family. Buy tickets HERE. 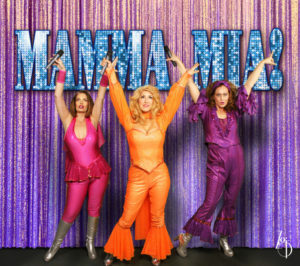 Friday and Saturday at 8 PM, Sunday at 6 PM. Join L.L.Bean for another complimentary cross country skiing adventure. The trek will take about two hours, so you’re asked to wear appropriate clothing and to bring water. Super speedy trivia at Lucky Ones Coffee, in the Park City Library makes for a fun aprés activity! One smart device is needed for your team – Wi-Fi provided. Live music, family fun, food specials, and fireworks this weekend at Park City Mountain’s Canyons Village. 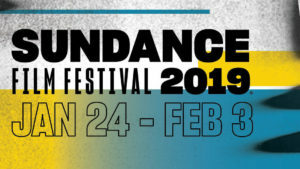 Part of “Love Your Library Week” – the Park City Library is hosting a free screening of this 80’s classic of teens who got detention in their library. Two tastings and one artistic activity, all rolled into one experience. And the best part – you get to eat the art. 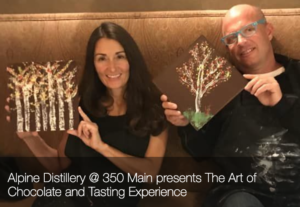 Join the Alpine Distillery at 350 Main to create a chocolate masterpiece while you sip spirits. All materials are included, the Alpine Distillery liquor tasting is added on for $15. The studio is open for some self-guided self-expression. Feel free to pick a painting and follow written instructions – or just go to town in your own way on canvas. All materials are included, but there is no physical instruction. 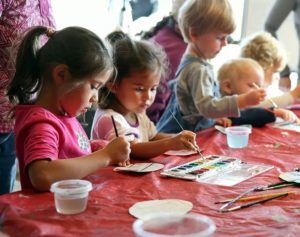 Your child will get to try out mediums like sculpture, painting, collage, drawing and more, with an age-appropriate exploration of texture, color, and shape. 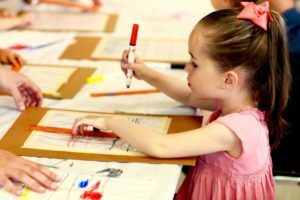 Child-sized art tools help with hands-on learning. Bring your lunch for this all-day immersion into drawing, painting, clay, mixed media, and more! 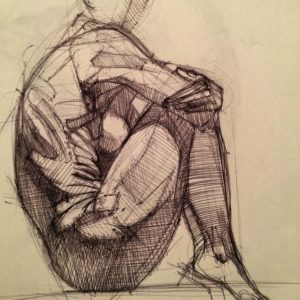 Kimball Art Center Members receive 10% off class tuition. January is marching right along, with plenty of snow to keep things looking fresh. 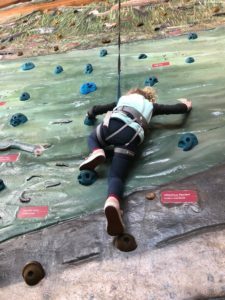 Things have quieted down a bit after all the holiday hullaballoo, but there are still plenty of fun, family-friendly things to do in and around Park City. Here’s this weekend’s Event Guide! 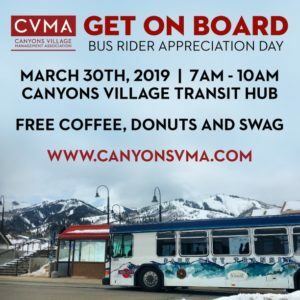 Next, the group climbs aboard a luxury bus for stops vehicle for our other stops at the Ontario Mine, Miner’s Hospital, First National Bank on Main Street, Silver King Consolidated HQ, and the Red Light District. Wines are chosen for each stop by Kirsten Fox, Headmistress and executive sommelier, and are paired with light snacks. Live music is a huge part of the experience at Deer Valley for aprés ski beverages and snacks. Silver Lake Lodge is located mid-mountain, near the ski beach. You’ll find the Edgar Beer and Spirits (EBS) Lounge on the second floor of Snow Park Lodge, at the base of Deer Valley. 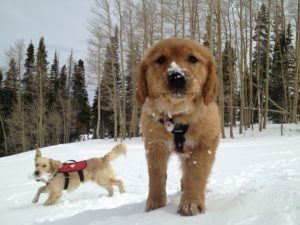 Aprés options at Park City Mountain, too, with a couple of live music opportunities and, of course, the avalanche puppy meet & greet! It’s Casino Night Social at the MARC – hosted by the Tennis Department. Play tennis, meet fellow tennis enthusiasts and bet on an exhibition doubles match between the MARC Tennis Pros. Snacks are provided; attendees are encouraged to bring their own beverages. Teenaged Astrid Lindren, who later went on to write the Pippi Longstocking series, leads a carefree life with her family in the stunning forests and fields of rural Sweden. Restless and eager to break free from the confines of her conservative upbringing, she accepts an internship at a local newspaper where she attracts the attention of its married editor. 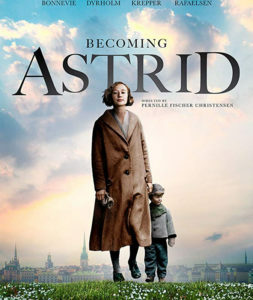 After Astrid becomes pregnant, she leaves her childhood home and goes to Copenhagen to secretly give birth to a son whom she reluctantly leaves in the care of a foster mother. After years, Astrid uses her imagination and flair for storytelling to reconnect with her son. In spite of her struggles, she emerges with a newfound courage that will later form the foundation of a vast and beloved body of work. A unique blend of modern electric blues, rock, and boogie which influenced many aspiring guitarists and bands throughout the history of modern American music. Top-40 songs “On The Road Again”, “Let’s Work Together”, and “Going Up The Country” became rock anthems throughout the world! Live music is a large part of the experience at Deer Valley for aprés ski beverages and snacks. Silver Lake Lodge is located mid-mountain, near the ski beach. You’ll find the Edgar Beer and Spirits (EBS) Lounge on the second floor of Snow Park Lodge, at the base of Deer Valley. 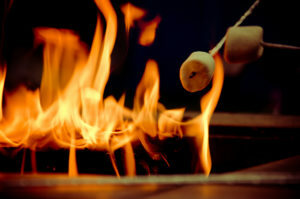 Aprés options at Park City Mountain, too, with a couple of live music opportunities and, complimentary s’mores! Bring your camera along to this class, taught by the Park Record’s very own Tanzi Propst. Learn to get that perfect shot by first building a foundation of knowledge about shutter speeds, apertures, focal lengths, and composition. Then, you’ll be ready to head out to a location to practice. Sign up HERE. 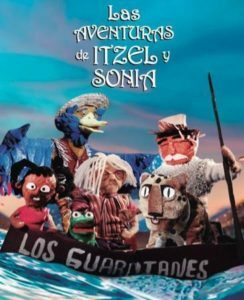 Itzel, an 8-year-old girl, and her best friend ‘Sonia the Frog’ will embark on a mission to find the guardians of the water, before the city’s supply runs out. 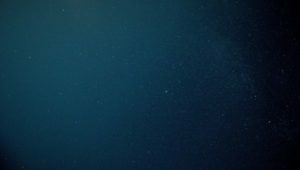 With the help of her grandmother, they will search in the most remote areas of Mexico, while a faceless being stalks them. 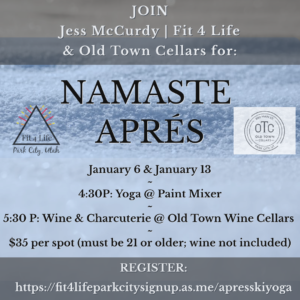 A mindful yoga event and community gathering at Paint Mixer & Old Town Wine Cellars: end your ski day –and prep for your week with a relaxing Namaste Aprés. Get moving and mindful on Main Street with 60 minutes of Vinyasa Yoga Flow at The Paint Mixer, followed by delicious apps, local wine, and community at Old Town Cellars. 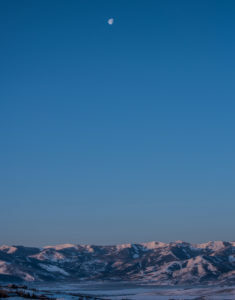 Both locally-owned businesses are located right at the bottom of Town Lift, in the heart of Old Town, Park City. 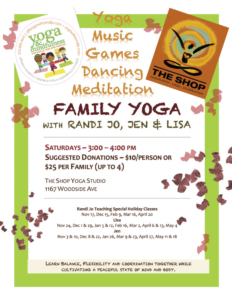 Yoga will be led by Jess McCurdy, founder of Fit 4 Life Park City. 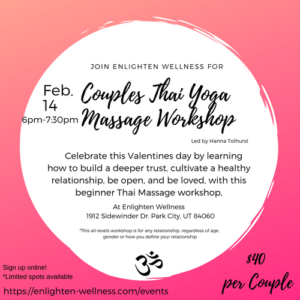 $35 includes your 60-minute yoga class, appetizers at Old Town, and entry into an opportunity drawing for a uniquely Park City gift (must be 21; wine is not included). 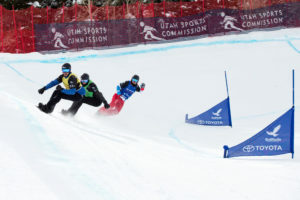 It’s Learn to Ski and Snowboard Month here in Utah. This means, all month long, you’ll find beginner learning deals from both the resorts and from a number of retail shops. Also on tap for the first month of the new year – the final days of Snowfest at Park City Mountain, and another round of First Friday Fireworks! Our pick this week is a community yoga & wine event on Main Street – make sure you read down to Sunday for details on Namaste Aprés. 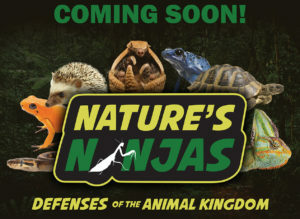 A fun Friday after-school activity for kids (ages 6 through 10). Participants get to explore art using a variety of fun materials each week. This week, build in 3D: kids will engineer structures out of bamboo, cardboard, and other materials. Drop-ins are welcome! Park City Mountain is celebrating the ski season with Snowfest, and the party doesn’t stop until January 6! We love this new tradition – and not just because the fireworks start (and end) early enough for the littlest ones to enjoy them! First Friday Fireworks happen the first Friday of each month, all the way throughMarch. 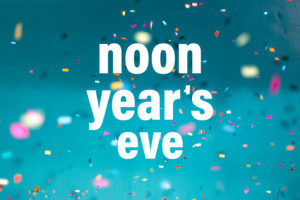 There’s live music, family fun, food specials, and of course, the fireworks; the fun starts at 2:30 p.m. and you can still get the kiddos home and settled for bed right on time. Live music sets the tone at Deer Valley for aprés ski beverages and snacks. Silver Lake Lodge is located mid-mountain, near the ski beach. You’ll find the Edgar Beer and Spirits (EBS) Lounge on the second floor of Snow Park Lodge, at the base of Deer Valley. 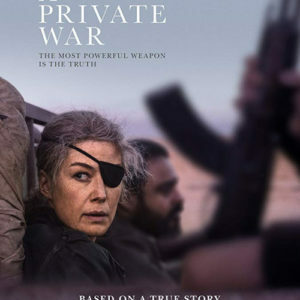 Based on the extraordinary life of Marie Colvin, “A Private War” is brought to the screen by Academy Award nominee and critically acclaimed Matthew Heineman in his pulse-pounding narrative feature debut. In a world where journalism is under attack, Marie Colvin is one of the most celebrated war correspondents of our time. 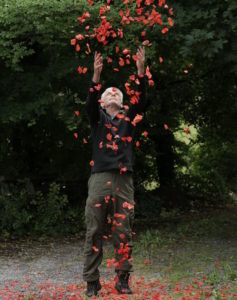 Colvin is an utterly fearless and rebellious spirit, driven to the front lines of conflicts across the globe to give voice to the voiceless, while constantly testing the limits between bravery and bravado. Her mission to show the true cost of war leads her — along with renowned war photographer Paul Conroy — to embark on the most dangerous assignment of their lives. 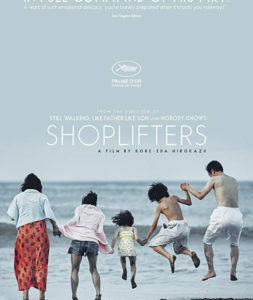 Friday and Saturday screening: 8 p.m.; Sunday @ 6 p.m. 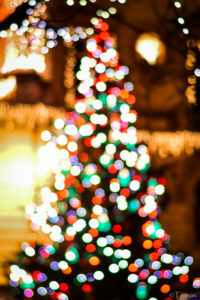 This is the second –and final– weekend for the Park City High School’s lacrosse teams’ Christmas-tree-pickup event. Trees are hauled away to the proper recycling center, and all of the money raised goes to support the teams. The annual program is the primary fundraiser for the Park City High School Boys and Girls Lacrosse teams, and your fee is tax-deductible. SIGN UP HERE and get more info HERE. Get up and get to WERQ – head to the Fieldhouse for the Fitness Wellness Fair first thing on Saturday morning! Take some free fitness classes and get 20% off all fitness memberships (including punch passes). More info HERE. Learn about wetland science, natural plant and animal species, and the history of the Swaner Preserve, search for and identify animal tracks and other signs of animal life. Wear sturdy, warm boots, snow pants, hats, gloves, a coat, and bring a water bottle. Snowshoes can be rented from the EcoCenter – $2.50 for members, $5 for non-members. 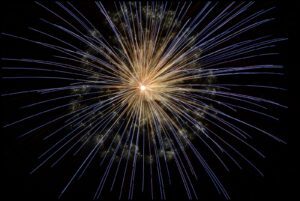 What better way to ring in the new year than by learning the tools to tap into your intuition? Sign up for the day and then select a Nordic skiing or snowshoe adventure, followed by a HIIT (high-intensity interval training) class at The Beau Collective. 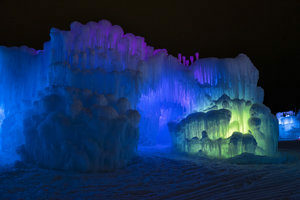 The Ice Castles in Midway open up today! Trek over to the Homestead Resort to enjoy a spectacular sight. 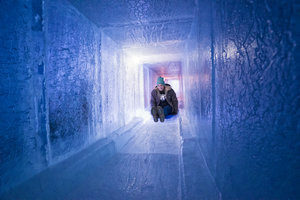 On Saturday afternoons, there are appearances from the Snow Princesses (noon – 3 p.m.), and you can grab pictures with them at the entrance of the Ice Castles. Saturday evenings bring fire performances from 7 to 10 p.m. (these also happen on Friday nights). 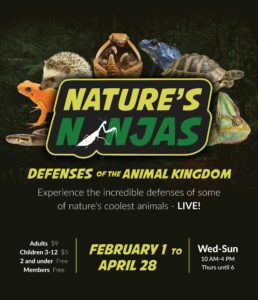 Check the website for details – including tips to make your adventure more fun – and for the schedule. 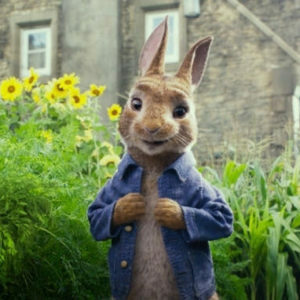 A free screening of “Peter Rabbit” in the Books 2 Movies Park City Film Series. This weekend, come and enjoy the adventures of Peter Rabbit and his three sisters — Flopsy, Mopsy and Cotton-Tail — as they spend their days in Mr. McGregor’s vegetable garden. Live music is a huge part of the experiences at Deer Valley for aprés ski beverages and snacks. Silver Lake Lodge is located mid-mountain, near the ski beach. 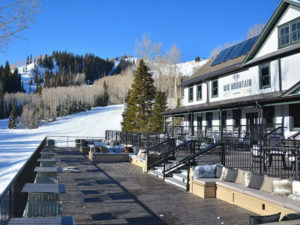 You’ll find the Edgar Beer and Spirits (EBS) Lounge on the second floor of Snow Park Lodge, at the base of Deer Valley. Delete your [social media] account. This – from one of the pioneers who helped create the world wide web. 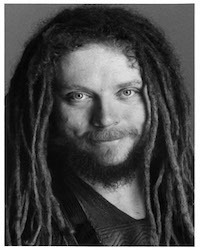 Jaron Lanier is equal parts scientist, musician, writer, and virtual reality entrepreneur, who now devotes his life to finding a better way through the digital culture. He has shared his ideas about where the internet has taken wrong turns, and how to right them—at every TED conference since its inception. You’ll want to hear what the author of books including Ten Arguments for Deleting Your Social Media Accounts Right Now, Who Owns the Future?, You Are Not A Gadget, and Dawn of the New Everything: Encounters with Reality and Virtual Reality, has to say about the ways digital life can help—and hurt—society. End your ski day –and prep for your week– with a relaxing Namaste Aprés experience. 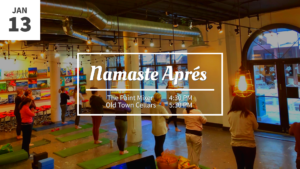 Get moving and mindful on Main Street with 60 minutes of Vinyasa Yoga Flow at The Paint Mixer, followed by delicious apps, local wine, and community at Old Town Cellars. Sign up HERE. Both locally-owned businesses are located right at the bottom of Town Lift, in the heart of Old Town, Park City. Currently touring with three original members (Jock Bartley, David Muse, Mark Andes), longtime drummer Sandy Ficca and talented newcomer Gary Jones, Firefall continues to make great music with hits like “You Are The Woman” and more. Firefall was inducted into the Colorado Music Hall of Fame in 2015. The upcoming days are all about a clean start – and enjoying the few new inches of fresh powder on the way! Here are a few ways to clean up your Christmas act, courtesy of Recycle Utah and the PCHS Boys and Girls Lacrosse teams. Sign up to get your tree hauled away – right from your front yard. Park City High School’s lacrosse teams will be doing a mass Christmas-tree-pickup event the next two Saturdays and Sundays (homeowners in The Colony can sign up for a January 6 pickup). Trees are hauled away to the proper recycling center, and all of the money raised goes to support the teams. The annual program is the primary fundraiser for the Park City High School Boys and Girls Lacrosse teams, and your fee is tax-deductible. 9am on the day prior to your scheduled pick-up. SIGN UP HERE. Now – on to the Event Guide! AIARE Avalanche Rescue is a one-day, stand-alone course. In order to stay on top of best practices, it’s recommended to be retaken on a regular basis. Both new and experienced recreationists, along with aspiring snow professionals, are encouraged to attend. 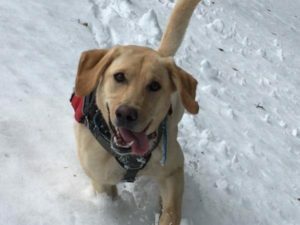 New participants learn the basics of companion rescue and return participants expand their skill set with advanced topics and realistic scenario practice to help improve their skills. Every single person will have the chance to get professional coaching on their rescue skills and will receive a rescue card acknowledging completion date at course end. AIARE recommends that all backcountry travelers keep their skills current by taking an Avalanche Rescue Course and receiving a rescue card at least every other year. Sign up and more info HERE. 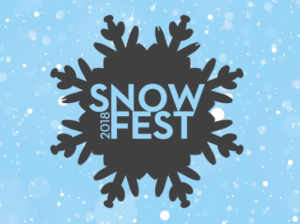 Park City Mountain is celebrating the holidays – and ski season – with Snowfest. The party doesn’t stop until January 6! 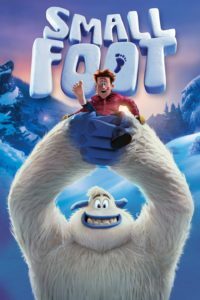 Enjoy the newly-released “Smallfoot” at 10:30 a.m. at the Kimball Junction branch of the Summit County Library. 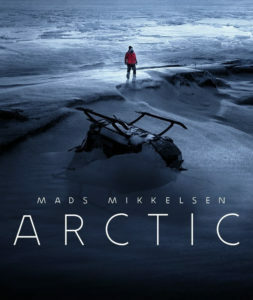 The film, which follows the epic journey of a friendly Yeti who discovers the existence of a mysterious creature called a human. It will be shown on the big screen in the Richins Auditorium. “The Greatest Showman” is the final Winter Break Film Series feature. Admission and popcorn are free, simply show up and enjoy the show! The Winter Break Film Series is a partnership with Park City Film and the Park City Library. This particular painting . has become a Park City classic! Join the fun with step-by-step instruction (all materials are provided). This event is 21 and over only, as adult beverages are available for purchase. The Paint Mixer is Utah’s first local paint and beverage experience. May our studio be your creative space, where you can let loose, get messy and create without judgment! You’re asked to register ahead of time to ensure your seat. 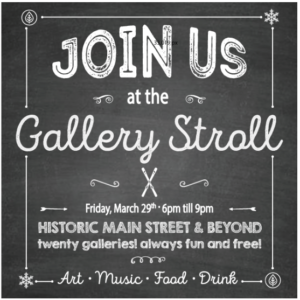 The Last Friday Gallery Stroll is presented by the Park City Gallery Association. 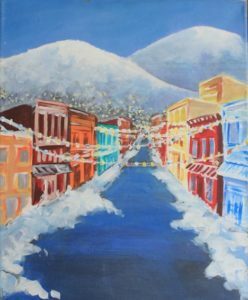 It’s a free community event held each month to give locals and Park City visitors the chance to check out Park City’s vibrant art scene. Queen Nation, a tribute to Queen, was formed in 2004. The mission of the show is to carry on the musical torch and pay homage to the golden age of vintage Queen concerts. Audiences are amazed at the accuracy of Queen Nation’s live retrospective journey through such Queen songs as We Will Rock You – Bohemian Rhapsody – We Are The Champions – Crazy Little Thing Called Love – You’re My Best Friend – Another One Bites The Dust – Under Pressure and many more. This is the story of the son of a Baptist pastor in a small American town, who is outed to his parents at age 19. Jared is faced with an ultimatum: attend a conversion therapy program – or be permanently exiled and shunned by his family, friends, and faith. 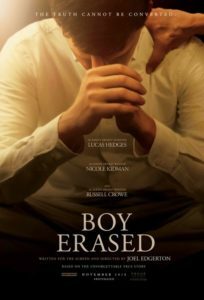 “Boy Erased” is the true story of one young man’s struggle to find himself while being forced to question every aspect of his identity. Students will learn fun hand-building techniques to make whatever snowscape they please: igloos, snowmen, snowflakes, snowy mountains, and more! After constructing pieces, students will apply slips and underglazes to finish their piece. 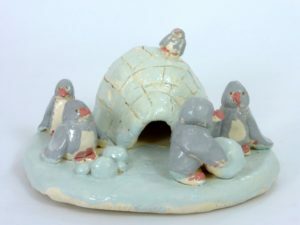 Due to drying and firing times, pieces will be ready 10-12 days after the class. A learning experience at Discovery Gateway in SLC, this is an exploration of Kwanzaa, which celebrates African heritage, unity, and culture. Learn through hands-on activities, like basket-weaving and necklace-making. Each and every Saturday, you can head over to Lucky Ones Coffee Shop (in the Park City Library) for trivia. The perfect aprés activity for the whole family. Be sure to have at least one smart device is needed for your team (wi-fi provided). Bring the entire family to learn the basics of wheel throwing together. First, a demonstration, then students learn how to throw on the wheel, decorate and glaze finished pieces with hand-built embellishments. 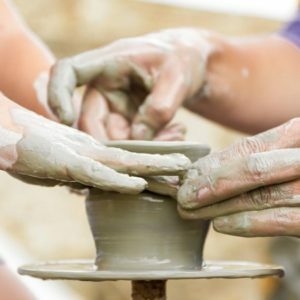 The class is recommended ages 4+ (children under 7 cannot use a wheel without an adult); due to drying and firing times, pottery will be ready for pick up 12-14 days after class. L.L.Bean will lead this snowshoe trek (or hike) at the Round Valley Rail Trail. The activity level is easy-to-moderate, and you’ll get to explore Round Valley’s beautiful open space. Bring your snowshoes, meet at Quinn’s Jct. trailhead, and wear your layers –and your sunscreen! Admit it – you’ve probably always wanted your own ski sign! Here’s your chance to create your own! Register for the experience, and once you sign up, you will receive a card to fill out what you would like on your sign. Next steps: sand, stain, stencil and paint your way to a totally professional-looking sign! 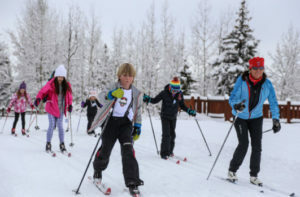 There will be another ski sign event Sunday from 1 – 3 p.m.
One of a number of Learn to Curl sessions throughout the year; you’ll need clean sneakers, and warm, loose clothing (stretchy pants, jacket/sweater, hat, gloves. 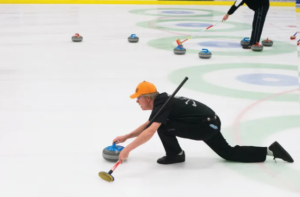 The Curling Club provides ice, stones, hacks, sliders, helmets, and brooms. Pre-registration is required. 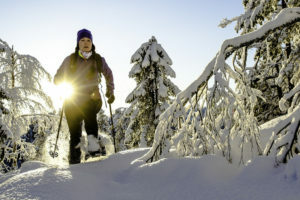 The best local areas to enjoy cross-country skiing, snowshoeing, sledding and winter hiking from the L.L.Bean experts. Sign up HERE. This one is always a sell-out – and it’s back by popular demand! 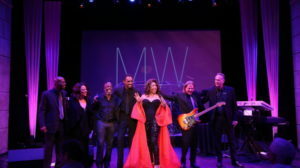 This is the longest-running Michael Jackson tribute band, and the Egyptian Theatre describes it as a power-packed experience of the music and moves of the King of Pop. Full band & stage show. Buy tickets HERE. 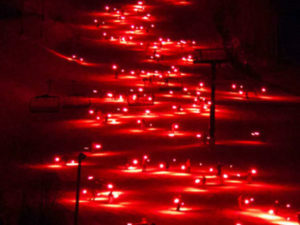 The Deer Valley Torchlight Parade begins at approximately 6 p.m. (dusk) on Big Stick ski run on Bald Eagle Mountain, right behind Snow Park Lodge. If you don’t go for the incredible sight, go for the complimentary hot chocolate and cookies (served on the Snow Park Plaza from 5:30 to 7:30 p.m.). 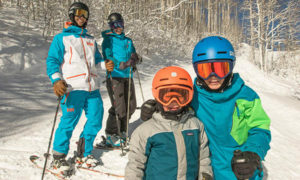 Family activities, a live concert, and a free fireworks display tops off the New Year’s Eve Celebration at Park City Mountain’s Canyons Village base area. Fireworks display will take place at 7:30 p.m., the Cabriolet lift and Frostwood gondola will remain open until 9:00 pm. Ring in 2019 at a kid-appropriate time. Children of all ages will enjoy this fun-packed bash with music, handmade party hats, a celebratory bubble wrap stomp, and a balloon drop at noon. 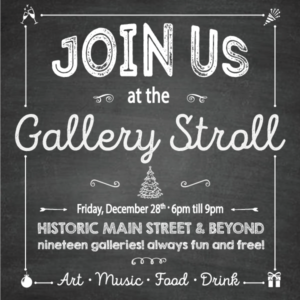 There will be noisemakers, resolutions, and lots of art-filled activities too. More info HERE. Park City Institute’s classic New Year’s Eve features two-time Tony Award winner Sutton Foster, in her critically acclaimed one-woman show. The Tony-award winning actress, recording artist and star of TV ’s comedy-drama, YOUNGER, will take center stage, sharing songs from her latest CD, Take Me To The World, as well as her albums, Wish, and An Evening with Sutton Foster: Live at the Cafe Carlyle. Expect some stories, and perhaps few tunes from Thoroughly Modern Millie and Anything Goes, and some of her other favorite roles. Amethyst tickets include an invitation to our private New Year’s Eve party. If you go all out on New Year’s Eve, this could be your ticket to feeling a bit better on New Year’s Day. A detoxifying Yoga Kula practice advertised to leave you feeling cleaner on the inside and more energetic on the outside. 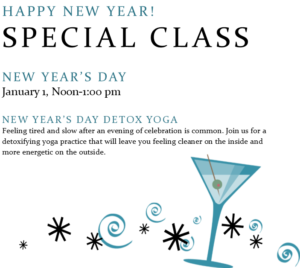 Join the class at the Westgate Park City Resort & Spa. You’re asked to call to reserve your spot: 888.852.2959.